It’s almost Halloween!!! It’s almost Halloween!!! It’s almost Halloween!!! It’s almost Halloween!!! Excuse us, it’s a bit exciting here as Halloween is our favourite festival! We get a bit excited at this time of year, and, to extend that excitement to you, we’re giving away a FREE Halloween e-pack to all new subscribers this week! If you missed the sign-up pop up earlier (because you were so enthralled by this blog, we know, it’s an easy thing to do!) then click here to bring a new one up! Signing up is free, we don’t do spam, and you get a free Halloween e-pack with: a customisable treat recipe suitable for dogs and cats (but easily adaptable for other animals! 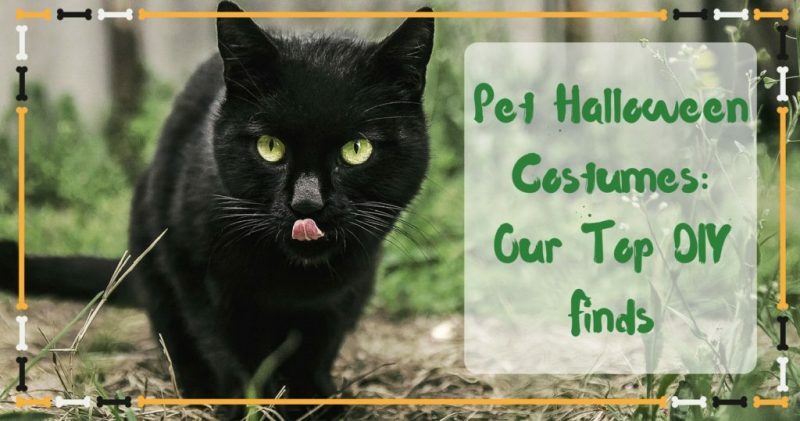 ), a Halloween poster, some cut out spooky silhouettes to decorate your house with and cut-out labels to adorn your bags of homemade pet treats! Bonus! Aside from our great sign-up offer, we were wondering how else to celebrate this time of year with this week’s mini blog. We’ve had a quick scout around out on internet land (we mean Pinterest, have you check out our Pinterest lately?!) 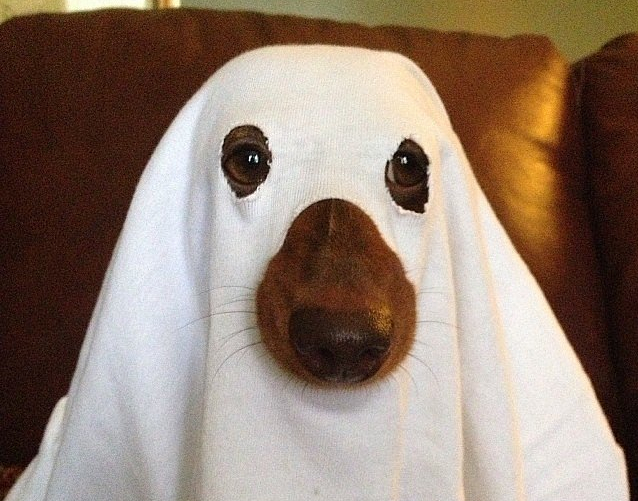 to find you some of the coolest dog costumes that YOU can make this Halloween!! Do you remember beanie babies? The crazy swept the nation in the 90s and everyone had Beanie Baby toys! One of the most memorable things about Beanie Babies was the TY tag. 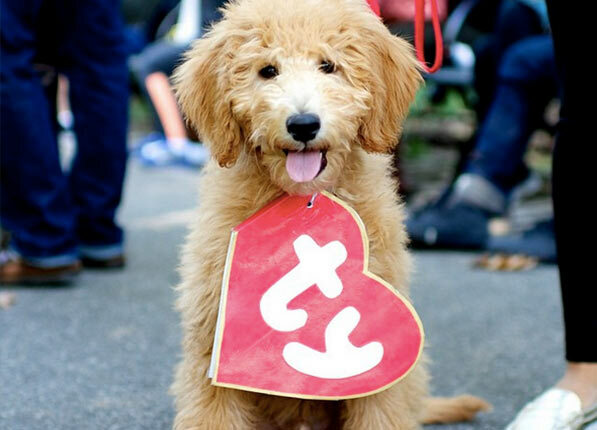 Here is a tutorial from PureWow on how to make your pup look like a cute beanie baby this Halloween! This one is so easy it doesn’t even need a tutorial! Grab an old white sheet and cut out eye and mouth holes. Plonk it on top of your pup and see how long he takes to shake it off! The Next Bird brings us this gem of a costume. It needs a little bit of sewing, but it’s still really simple! 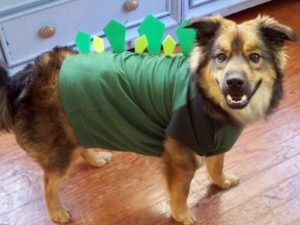 Turn your pooch into a stegosaurus this Halloween! I’ve got a dinosaur onesie somewhere, we could go trick or treating as a pair…! 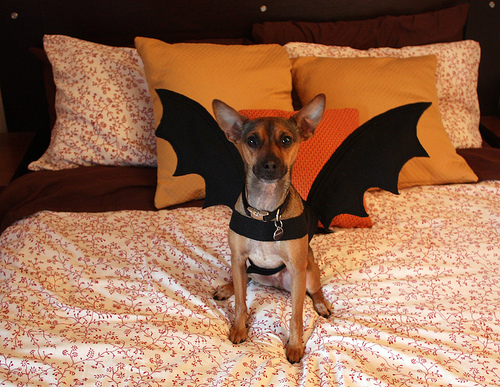 Back when Texts From Dog were posting regularly, Dog always wanted to be Bat Dog! I think that Dog should have had this costume from Life At Clover Hill! Proper Bat Dog! 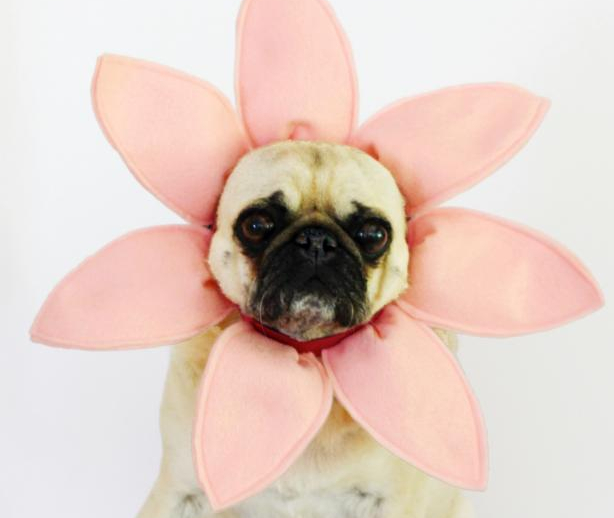 There is just something about Pugs dressed as flowers that makes me feel all warm and fuzzy inside! While flowers aren’t completely Halloween, you could always use the idea to make DIY Network’s Flower Costume a bit more horror themed (Zombie Flowers anyone?). We’d love to see them! Why not try HGTV ? It’s on the advanced side of tricky and can, again, be spruced up to be more scary. 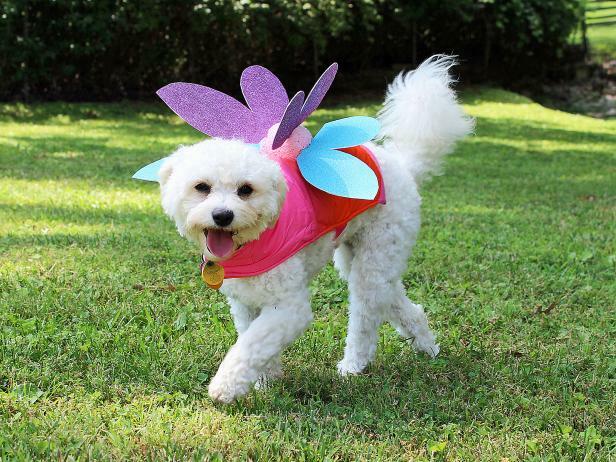 Or you could keep it a simple fairy costume for your dog, either way! What a great idea! This is one of the most brilliant Halloween costumes we’ve ever seen! Pure brilliant! 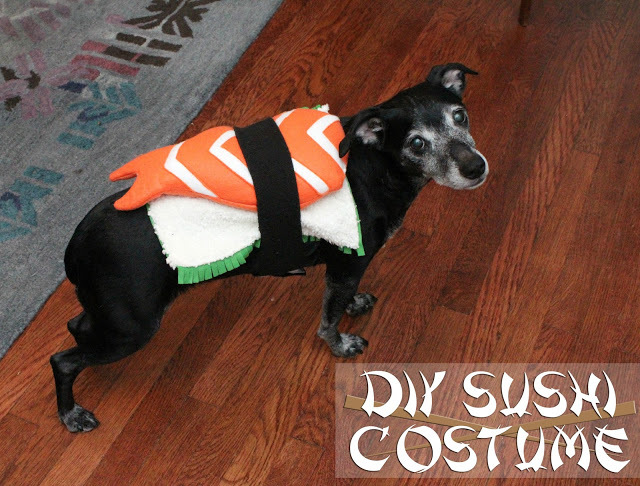 A dog sushi costume!! This ingenious tutorial comes from Eat Sleep Make and is certainly a little involved, but look at the result! We’re wondering if you could have a whole pack of dogs as different types of sushi. Photos please! Let me take you back to THAT viral video from 2014 then you will know the hilarious prank practically won the internet that year! 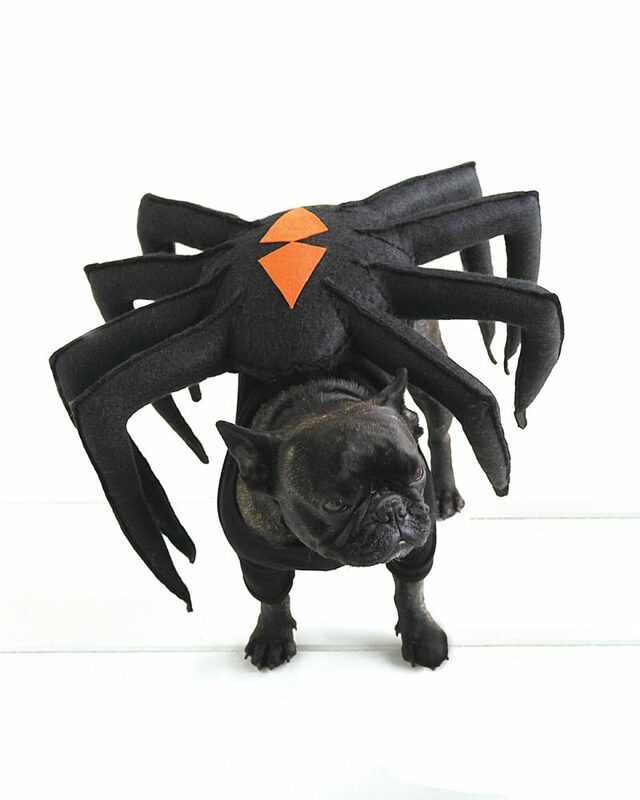 Luckily, Martha Stewart has a tutorial to make an (almost as cool) version of the Giant Mutant Spider costume! Just keep an eye on your pet’s safety if you are planning to terrorise poor unsuspecting friends and family! We hope you’ve enjoyed our costume ideas and have found to the time to sign up to our mailing list!